Members of the Media Present; Ladies and Gentlemen; All Protocols Observed. I would like to acknowledge the absence of our MEC, Mr Sihle Zikalala who has other prior arranged commitments. However, we are delighted to have been invited to participate in this important session, where we are sharing our optimism with the rest of the world that this year we are going to experience another bumper Africa's Travel and Tourism Indaba as it had happened in the previous years. This continental premier tourism and travel show has become a pilgrimage for many stakeholders in the tourism industry inclusive of exhibitors, travel agents, tour operators, airline representatives and of course members of the media community. 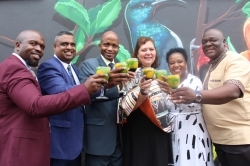 This is because it serves as a platform to sample various tourism products that this region and the Province of KwaZulu-Natal could offer to the world. More importantly we are grateful to the media for their continued support by heightening global awareness about the significance of Indaba as the rendezvous for African tourism and travel business practitioners where they showcase their products to the world. With around 691 journalists and media experts having covered this event last year, once again this year we are looking forward to an increased figure of the news people especially that Indaba would serve as a stage rehearsal for the news coverage of the South Africa's sixth general elections, scheduled for 8th May 2019. Our call for KwaZulu-Natal and the coastal City of Durban to become the permanent seat for this mega event is influenced by a combination of factors. We are blessed with a plethora of tourism attractions that are ideal retreats for the thousands that would be gracing this travel and tourism show. Besides the province's exceptional natural and topographic splendor, we also boast a tapestry of cultural heritage peppered with the African, European and Asian experiences. This makes this province a real world in one - and a home away from home for many people landing on our shores, either as general holiday makers or members of the business community and as well as the media. The excellent world class conference and accommodation facilities and transport logistics are amongst the ingredients that make this city and the province the natural host for a giant gathering like Indaba that continues to contribute to the region's economy. 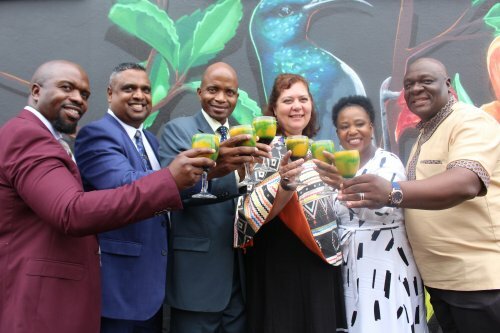 The favorable year-long warm climatic conditions and second to nil customer service are also at the core of our belief, and indeed of the world that Durban should host this tourism and travel industry exhibition on a permanent basis. This would be good for our province, the country, the African continent and the world as we hold the view that tourism spoils should be shared across all regions. If Madrid in Spain had become home to annual spectacular tourism expo, International Tourism Trade Fair, affectionately known as Fitur why can't the world declare Durban the infinite host of Indaba because millions of tourism enthusiasts the world over love this place! The Province of KwaZulu-Natal is fast becoming one of the world's aviation hubs as we are currently developing an airport inspired urban precinct, the aerotropolis on the north of Durban, which is anchored by King Shaka International Airport that continues to attract world renowned airlines. With the Emirates, Turkish Airlines, Qatar Airways and Ethiopian Airlines conducting direct flights to this brand new airport, last year we welcome another giant airline, the British Airways that now flies directly from Heathrow Airport. The airline has acknowledged King Shaka International's growth prospects to become a popular travel destination for both tourists and trading community. It is therefore crucial that African states work closely in consolidating and strengthening Indaba as their proud avenue to host the world and be able to market their diverse tourism products and to attract investments essential in repelling poverty and other socio-economic challenges. This therefore confirms that as South Africans and the citizens of in the Province of KwaZulu-Natal we regard this giant gathering as an African platform to grow our economies through tourism which had proved to be the future of world economy as it remained on the growth trajectory amid the often jittery global markets. This is the sector that had maintained its 9% annual contribution to South Africa's GDP which is estimated at R425 billion in terms of monitory value whilst other industries floundered amid recessional conditions triggered by the 2008 global financial crisis. The World Tourism and Travel Council estimates that around 1.5 million people are employed on the tourism and travel sector in South Africa. This is a substantial figure that confirms that this industry is the future of the country and the region's economy hence South Africa has set an ambitious target of 2.1 million people to be working in the tourism and travel business by 2028. However, succeeding in accomplishing our employment targets would depend on the identification, packaging and marketing of diverse tourism products that define who we are as South Africans and the region. Certainly, KwaZulu-Natal wants to become the leading tourism destination on the continent which is reflected in the province's Master Plan which calls for amongst other things the development of new tourism products and attractions that would guarantee increased volumes of big spending international visitors while also capitalising on the province's lion's share of the domestic market. The province intends growing tourism contribution to its economy to reach between R65 billion and R98 billion in the very near future that would result in the generation of not less than 183 000 job opportunities for the people. We are therefore delighted to stress that besides investing in the improvement of aviation facilities, government in liaison with the private sector are actively involved in the development of modern tourism infrastructure. World class hotel resorts are being conceived in our breath-taking holiday retreats such as Tinley Manor Beach where a R1.2 billion tourism infrastructure is taking shape whilst another R350 million has been injected into the construction of the Blythedale Coastal Resort. This is just a sample of numerous tourism products taking shape across the province to respond to the global mood where tourism and travel are significantly impacting on the country and province's economy. Events such as Tourism Indaba serve as platforms for the province to reveal to potential investors an array of business opportunities they could consider as we continue with our crusade to grow the province's economy to be able to collapse the vestiges of poverty, joblessness and inequality. Finally ladies and gentlemen, we also want to reiterate that we are mindful of the stiff competition in the world market hence we are emphasizing the deployment of new technology in all facets of the tourism and travel business as we would appreciate that succeeding in this business is now depended on the use of online services to book flights and accommodation and of course to check which destination offers better tourism attractions. The embrace of the Fourth Industrial Revolution phenomenon demands that we encourage tourism and travel practitioners to get into the groove to be able to stand the competition and in this province and the country we are fully aware that our ambition to become the region's leading travel destination, would require considerable investment in the development of new technologies that make travel convenient for our visitors and potential investors. Once again, thank you very much for your support and we are looking forward to meeting you next month!